For those of you who have been following along with Charlotte's Scrapitude mystery quilts these last couple of years, I wanted to let you know that Charlotte's husband, Ray, passed away suddenly on Thursday, November 3. Please keep her and her family in your thoughts and prayers during this difficult time. For those of you who had asked me over the last few weeks about whether she was doing a mystery quilt again this year, she was working on one. Her website hadn't been updated yet but she has a little information posted in her Facebook group with some initial cutting instructions. You'll need to scroll down on the wall in the group to find it. I haven't been to guild in a few months so I can't clarify anything for you--sorry. Okay, you may recall me talking about my "secret project" that I was working on last summer, that really wasn't actually all that secret. I was working my way through Charlotte's 2015 Scrapitude mystery quilt "Scrap-in-a-Box" as a pattern tester/mystery tester last summer so that I'd be prepared to have everything on my blog this year when she was ready to go. And then she was able to launch her own blog. Woo hoo for yoooo, Charlotte! I was thrilled! And I immediately ceased work on the final stages of Scrap-in-the-box knowing that I'd be able to catch up with everyone once y'all got to play along too. I had a few other pressing-need-projects to refocus on at that point, and I thought it would be more fun to do the last couple of steps in a crowd. Unfortunately, because I'd originally been taking pictures with the intention of posting steps, I have great photos of individual units under my sewing machine, but not the nice reveal of all the completed units for any one step. And after having worked through the mystery steps with me, Charlotte changed them up a bit so my unit photos don't always match what you're actually going to be doing--at least, in terms of what units get done when. So this is all I have to show you for Step 1. One measly unit. But really, I did get all 82 of those units done; it was just a long time ago and they all got...well...I can't really tell you now, can I? Be sure you've subscribed to Charlotte's blog to get the rest of the Scrapitude steps: scrapitudequilts.com. The next one is released on February 10, 7:00 p.m. Eastern (or thereabouts). You'll also want to check out one of her recent posts on what "random but pleasing" means--great information! Woot! Charlotte's in the Blog-o-Sphere! ScrapitBonzaTude--my version of Charlotte's 2013 Scrapitude mystery quilt. You've been waiting and waiting...and your patience has been awarded. Our talented Charlotte of Scrapitude Fame now has her blog up and running! Go add her to your feeds and give her some commenty-love! She's got the cutting instructions for Scrap-in-a-Box posted (but I'll still be leaving them on my blog here as well). She'll be starting to post the mystery clues in January--and I won't be posting them here so make sure you're following her blog to get them as soon as they go live! Charlotte is still working on getting her blog set up, so I'm posting cutting instructions for Scrapitude 2015: Scrap-in-a-Box here. We'll transfer everything over to her blog once it's ready to go! Finished size: 58" to 74" including borders. Instructions will be given for both “traditional” cutting (using your normal rulers) as well as instructions if you choose to use the Easy Angle ruler for those of you who may own it. You’ll be sewing some diagonals. You may want to check out the Clearly Perfect Angles tool from New Leaf Stitches. I love mine. Just a few of my scraps that have been put to use. I 'm a huge fan of a nice, crisp, white background on a scrap quilt. My white background is scrappy, but all the same white. You'll eventually need approximately 3 yards plus 1/2 yard for contrasting border. However, you may want to hold off choosing this until you see the blocks. Plus, the sashing is kinda special so don't get ahead of yourself here! Okay--get sorting and cutting! You've got until January 13, 2015, to have everything ready to go. I have a freaking boatload of 2 ½” and 5” squares in my stash. So after I’d set aside the 2 ½” squares I needed, I then cut a bunch more down to make my 1 ½” squares. I also got heartless and cut down a bunch of 5” squares for both my 2 7/8” and 4 7/8” squares. I know some of you may think, “Cutting a 5” square down to 2 7/8”? Isn’t that a huge waste of fabric?” Well, sure. But as far as I’m concerned, it was better than (1) taking the time to cut individual scrap pieces into squares, or (2) cutting more strips for the squares and ending up with leftover squares at the end thereby increasing my stash rather than decreasing it. Plus it’s worth the “real estate” those stinkin’ squares are taking up in my scrap bin. The more ways I can use them up and move them out, the better! It took me awhile to choose a blender fabric. I finally settled on a medium tone-on-tone blue that’s been in my stash for a long, long time. I like the print but I don’t love it, so I thought it was a good one to cut into smaller pieces and spread throughout a scrap quilt. Remember what they say about ugly fabrics? "You just haven't cut it small enough." 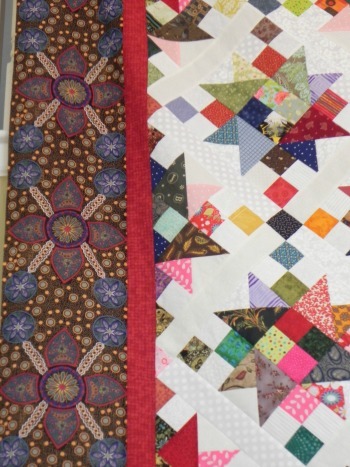 Scrap quilts are a great time to use those less-favored fabs up! Not familiar with the Easy Angle Ruler? Check out this YouTube video. ScrapiBonzaTude--my version of Charlotte's first Scrapitude quilt this past year. Yes, folks, the time is almost upon us! Charlotte's ready to lead another mystery scrap quilt! Fabric and cutting instructions will be posted this coming week (Tuesday, 9/6). You'll then have a few months to get yourself ready to go. This time, Charlotte has let us know that the completed quilt will be a "snuggly couch size approximately 58" x 74", including borders." She also describes it as being for confident beginners or intermediate quilters. If you are a beginner, you'll just need to go slow and watch some bias edges. But you should be able to do it. Nothing too off-the-wall! And advanced quilters will enjoy it too, of course. So, what are you waiting for? Join the fun! Some people love doing controlled palettes. Charlotte prefers doing full-on scrap in her own quilting, so her instructions are set up that way. I suggest you pay attention to the information she gives for value and suggested fabrics. (It's a gorgeous design and you don't want it to get lost!) Controlled palettes can simply be "controlled" along the same value lines. See below for a little more about controlled palette versus full-on scrap. My travel schedule is nuts this year. So that my absence doesn't slow things down for those of you working on Scrapitude, I've set up a form for you to use to submit your questions about Scrapitude. Charlotte will get the questions herself and be able to respond to you directly. I'll see the questions and responses and if there's something that may be helpful for everyone to know, I'll post it to my blog whenever I land again. So please use this form to submit your questions. If the form doesn't work for you, email your questions to me and I'll forward them to Charlotte when I see the email. Please do NOT use Twitter to ask questions--they get lost in the stream too easily. Never Done a Scrap Quilt? If you want to brush up on your scrappy knowledge, here's the listing I provided last year of past episodes I've done on scrap quilts. 1. Unless you're intentionally going for a low-volume or watercolor effect, be sure your background fabric/s have good contrast with your scrap (main) fabrics. Otherwise you lose the design as your block edges fade into the background fabric. 2. In the same way, when you're choosing your scraps, it's generally a good idea to avoid any large-scale prints with parts of the print that are too close to the color of the background fabric. When you cut those large-scale prints into pieces, you might lose the sharpness of the edge when a big white flower suddenly lands right up against your white background and makes your block look like someone took a chomp out of the edge. In a normal non-mystery quilt, large-scale prints can be planned for places where they'd work well. In a mystery quilt, though, you never know how pieces are ultimately going to be used, so large-scale prints can be very tricky unless the mystery quilt designer tells you where it would be okay to use one. If, however, your large-scale print has good contrast with the background overall, these can be great to use in scrap quilts because cutting it into smaller pieces will give you a huge variety of end results--it'll look like you used five different fabrics where it was only one to start. 3. If you have one really dark fabric, balance it out with other really dark fabrics. If you have one really light fabric, balance it out with other really lights. My difficulty on Easy Street was I was trying for a span of values in my controlled palette and ended up with one really dark green mottled-read-as-solid that just sticks out like a sore thumb on the finished quilt. All I can see when I look at it is this dark green visual hole plopped around the quilt. It was my first scrap quilt, and it was a mystery, so I had no way of guessing the end result. Since then, I've done a couple of other scrap projects where I suddenly realized I had one fabric really standing out in an unpleasant way; but rather than removing that one fabric, I balanced it out with others of similar value, and suddenly it all worked beautifully. So while testing the new Scrapitude, I chose a wide variety of scraps and made sure I had a good mix of values (according to Charlotte's directions, which you'll get in another few days). And it's worked really well. 4. Don't be afraid of full-on scrap! I was. I really struggled with Easy Street and the first Scrapitude. In fact, I was pretty sure after Easy Street I didn't want to do another scrap quilt. Ever. (Or another mystery, for that matter.) But when I let myself do full-on scrap, and let Charlotte keep telling me, "It'll be okay! It'll be okay!" every month at guild, I ended up having a ball and completely loving the end product. I had to fight with myself not to control the way those scraps were coming together in the piecing. I confess to a couple of times picking up two pieces and saying, "Yikes! No way am I letting those two colors near each other!" and swapping one out before piecing the unit. But I only did that once or twice before I convinced myself that would be crazy-making and just released myself to the process. When you see the finished quilt, you never see those two fabrics that maybe don't play nice in the sandbox together. Because they're part of a whole, overall wonderful scrappy design. That's it...although I may have other tips along the way. But for now--start staring at your scrap stash and thinking, "Yay! It's time for Scrapitude again!" Please note: The original Scrapitude instructions have now been removed from my blog, as Charlotte is in the process of writing it up as a pattern for eventual sale. You will still find my in-progress and completed posts, none of which contained instructions. *The second Tuesday of every month is my guild meeting. You'll be getting the clues the same day my guild-mates do! This time around, I did great on my weekend plans! Remember that Disappearing Pinwheel extravaganza from way back at the MLK Jr Day Sew-In? I finally got my top completed! I also did a backing for this one, a nice turqouise or aqua blue marbled cotton. It's now in the hands of the longarmer at my LQS. I'm having it pantographed, quilter's choice. Still haven't entirely decided what I'm going to do with this one but I'm thinking it may be a gift for a friend. I haven't come up with a spiffy name for this yet. The narrow inner border was from my stash, so the only purchased fabric for this was the outer border and backing. I fell in love with this border fabric. Not at all what I'd originally had in mind when I ventured to my LQS to find something. I'd been thinking a large print multicolored floral to balance out all the sharp pointy things going on in the center. I'd seen the bolt of this fabric on the shelf and liked that it had all the colors I was looking for, but since it had the vibe of an Australian aboriginal print design I didn't think it would really fit the feel of the traditional scrappy top. Later in my search, the staffperson pulled it off the shelf and we laid it out next to the quilt. There was a moment of silence, and we both said, "...Oh." And then, "Oh..." again. I loved the way the border motif mimicked the shape of the block, and it spoke to the colors in the quilt. I fell in love with it. Unique and unexpected--even better. I only debated it for several moments longer because it's a directional print with a distinct motif and I thought I'd hate myself for trying to work with that. Yeah, I probably would, but it was too perfect to pass up. My original intention was to do all sorts of math to get those motifs to work out as perfectly as possible, by taking little tucks in the border to pull the motifs together in a shorter repeat as needed. When it came right down to it, though...I was really trying to get the borders done in time to get the quilt to the LQS before it closed on Saturday. Plus, I'd already lost so many points and had so many things not meet up as they should've (you'll need to listen to my rant about a particular ruler for the backstory on that one) that this is nowhere near an heirloom or show-quality quilt anyway. It's going to be on a bed in my house...which bed is yet to be determined. So, in any case, me and my family are the only ones that will see it. My husband really likes it as-is, so I decided not to sweat the border and just get it on there. Magically, and thankfully, this is the first fabric I've worked with in this way in years that was actually mostly printed on grain! As I cut the fabric lengthwise (so I wouldn't have to piece the border), it was mostly in line with the motif. Amazing. So my priority of at least having the motifs appear relatively straight along the borders worked out pretty dang well. I didn't worry about where the motifs ended or mitering borders to make them match or anything. We were in Get-'Er-Done mode and I was absolutely thrilled to Get-'Er-Done! This is also now in the hands of my LQS longarmer and it's also going to get a pantograph. As I said to the woman taking my quilt, "If I'm ponying up for custom, it's going to be on a quilt where I can see all my points!" Got all my cutting done for my String Star class with Ami Simms at Lancaster AQS quilt week. I'm using various ethnic design fabrics. We're supposed to bring the uncut fabric to class "pressed and ready to cut." The best way I could think to do that was to press it, then lay it out flat one on top of another and carefully roll it all together. Here's hoping it's not a mess if we do get to the point of cutting that. And I collected all my supplies for the dye class with Frieda Anderson. I already had most of it, but I did take this as an opportunity to pick up more small containers with lids from the Dollar Store--they're a good size for fat quarters and you can even scrunch a half yard down in there if you're going for the scrunchy look, which I normally am. Pack of five for a buck. Can't beat it. I don't have to bring a ton of supplies because I did buy her kit, so she'll be giving us the dyes, gloves, a face mask, and some fabric. I'm also bringing extra fabric that I cut and folded later after I'd already taken this picture; she invited us to bring whatever else we might want to dye since we may have time to do more in the afternoon. I couldn't bring my dog (What? You can't imagine a Turquoise Retriever?) so I'm sticking with doing more PFD fabrics I can add to my collection. I got more done on my Spring postcard swap--can't show that yet, though! And, finally, in a last-Hurrah of the weekend, I got the binding on the quilt I won from Daisy in her giveaway a couple of months ago! Woot! If I recall, the name of the design is "State of Grace," so I've named this quilt "Daisy's Grace." My daughter wanted it for her dorm room, so I did a machine binding. She's very happy with it! DD is holding it up for the photo, and she's standing on the second step up on our staircase. She refers to herself as "fun-sized," so this is the perfect size quilt for her. She'll easily be able to wrap herself up in it while...ahem...studying. Detail of the pantograph design. I almost inevitably leave it up to "Quilter's Choice" on design and thread color--the most I'll usually say is "I want it to blend," or "I don't mind something that stands out on this one" or whatever. They used a nice beige thread that stands out a little, but not so much as to detract from the design. They always do a great job...which is why I usually say "Quilter's Choice!" I am so thrilled to be able to report that I'm not longer feeling overwhelmed by the number of projects I've got going on! Getting all this done this weekend has cleared off the top of my cutting table and my sewing table, plus a shelf or two. Things feel organized and in control again. About a week before my last guild meeting, a few of the #twilters (quilters on Twitter) decided they wanted to show their thanks to Charlotte for Scrapitude by making "wee gifties," as @verylazydaisy called them. They mailed the gifts to me and I made a surprise presentation of them to Charlotte at my guild meeting. With the short notice, I had gifts in hand from three people. Thanks so much to @SewExcitedQuilts (the keyfob), @artquiltmaker (the needle case), and @ddrquilter (the small wallhanging). I have been told to expect more so I'll be checking my PO box regularly. I won't be at my March guild meeting as I'll be at the AQS show in Lancaster, but I'll figure out some way to get them to Charlotte anyway. As you may be able to tell from the photos, Charlotte was very touched. She couldn't stop grinning and saying, "I don't believe it!" Thank you, everyone, for showing Charlotte some love! I'm writing this blog post on Saturday morning and thinking through what my long weekend will bring. I'm caffeinating and "charging" (as my husband calls it when he sees me sitting in front of my light box), and watching another lesson in one of my current Craftsy classes, "Complete Knife Skills" with Brendan McDermott--a freebie that has quickly become one of my favorite classes I've taken from Craftsy so far. But you'll just have to wait for my full review when I'm done with the class entirely. Speaking of Craftsy--they're having another sale this weekend, the "Perfect Match Flash Sale" in which you can get two classes paired together, both on sale. I've already glanced at some of the offerings but haven't spent a lot of time on the site yet. I have other things I need to get done today! In any case, as I'm sitting here getting ready for my day (which begins with a run to the grocery store), I thought it might keep me on track if I listed here my quilty-related goals for the weekend, and then I'll check in again sometime Monday evening and let you know what I actually accomplished. As we know, I'm a list-maker! 3. Put my dye studio back together. It's still dismantled from when I had to repurpose one of the tables for Thanksgiving dinner. I also still need to haul my old cutting table from my second-floor sewing room to my basement dye studio. This requires my husband's involvement. 4. Put the finishing touches on new cutting table--using my 3M adhesive strips as I mentioned in a previous podcast episode, and heat-setting the edging strip around the top. Now, here's the thing--some of my weekend schedule is still a bit up on the air. I may be making a nice dinner tonight, which means some of today will be spent in the kitchen, or we might be going out for a nice dinner, which means I'd not have to spend time in the kitchen. I can actually go either way on this one--after being gone for a week of vacation I'm very okay with spending a night in my kitchen. I enjoy cooking when I've actually got time to do it. But I'd also be very okay with having a whole afternoon to spend in my sewing room. So I'm viewing this as a win-win whichever way we end up going. Tomorrow I've got a commitment in the morning which means we may not be home until about 3p, and although I've got Monday off, I've got an appointment in the morning so may not have much sewing time until the afternoon. I still think I'll be able to accomplish all of the above. So here's to a long weekend, and being home, and getting homey kinds of things done. What are your plans for the weekend? For U.S. readers, do you have Monday off? I believe we've got a #PDSI going on, though it won't be as active as usual since this is a much-less common day off for most people. Indeed, this is the first year that I can remember actually having it off! Yay! *Whether I get the whole Scrapitude top pieced is less dependent on the amount of time I have this weekend, and more so on how long I can sit at my sewing machine doing the same thing over and over again. This is why I rarely make bed-sized quilts. Even with movies or audiobooks, I just get stir-crazy after awhile, so I may switch up what project I'm working on rather than plowing through one project for the whole weekend. As per my previous post about what @knittyAJ can talk me into, just wanted to remind y'all that there's another online sew-in this weekend as [some of us] have Martin Luther King Jr. Day off from work on Monday. I'm actually quite excited--I'm normally traveling for work over this weekend so I'm usually observing the incredible work of Martin Luther King Jr by being crammed in coach class on a plane or waiting for delayed flights. This year, I plan on listening to recordings of his sermons while I'm sewing. Seems much more fitting. So, join us for our sew-in! As usual, there's a Twitter hashtag: #MLKSI. If you're not on Twitter, you can still play along--you'll just miss some of the fun! A lot of us are going to have fun together by all sewing one or both or a combo package of the two versions of the Disappearing Pinwheel (DP) in that previous post. I've set up a Flickr group to make it easier for us to look at it in different color ways and settings. Anyone can check it out, even if you're not doing the sew-in or the DP! You'll find it here: http://www.flickr.com/groups/disappearingpinwheel/. People are already posting photos of their fabric choices...it'll be fun watching these develop! As soon as I'm done with work on Friday, I'll be doing the second part of Step #4 of #Scrapitude so I can get that one posted. Then I'll be choosing fabrics for my DP--and let the #MLKSI fun begin! With my "found time" yesterday and a couple of hours this afternoon, I finally have Scrapitude Step 1 done--woot! I'll probably do another Scrapitude linky sometime next week to let everyone check in on their progress. So you may want to put that on your to-do list for #BDSI! I do know that my schedule will not include any shopping. My hope is that I'll be spending at least some portion of the day having my traditional Jammie Day with my sewing machine. So, mentally, I'm listing the projects I'll be working on. So, to recap: the next Scrapitude clue will be posted after my guild meeting in January--we meet the second Tuesday, so you can expect it within a day or two of whatever that date is. If you haven't checked out the Scrapitude Flickr group yet, be sure you do! I consider it a significant benchmark that I finally finished cutting all my Scrapitude pieces. Woohoo, yay me, happy dance, n' like that. I got home Tuesday afternoon from my week of back-to-back meetings. Wednesday was a comp day, and I was a bit fried. I didn't feel like going out of the house to get batting for Baby Quilt Remix and was a little worried about trying to do any machine quilting, as tired as I was. I decided, therefore, it was a good day to crank up Netflix on my iPad (Midsomer Murders, my second time through the series) and simply knock out the rest of the cutting I had to do for Scrapitude. I do already have a little sewing done on the four-patches from Step 1, but not much. I'll be putting out a podcast episode this weekend (already started making my notes!). Meanwhile, I decided it might be time to do another Linky Party. I'm going to leave this one open until next Wednesday so you'll have the weekend to make as much progress as you'd like. That also means you may want to check back periodically to see who has linked up! Are you doing the Scrapitude Mystery Quilt by Charlotte? If so, link up your blog post about your progress so far here! Here's how far I've gotten on Scrapitude, and I started a whole lot sooner than all y'all! I still have about 60 scrap squares and nearly all my background to cut. But wait! I do already have bunches of squares sewn into pairs. Okay, so I cheated a little. I raided a project bin I'd started last spring to do a Jacob's Ladder scrap quilt. Holy Moly, I have enough 2 1/2" squares for probably four Jacob's Ladder quilts after I get Scrapitude done, so all's fair in UFOs and Finishes. And, since I did that little tutorial on nested seams in four-patches last time, I do have two four-patches done. Yay me. I'll be talking about scraps again in this week's podcast episode (coming soon! ), but meanwhile, I thought it would be worth re-posting some of the past episodes I've done on scrap quilts. Unfortunately, with the move to the new website last spring there's not an easy way for me to do older episodes here. If I repost them into my podcast feed, it'll suddenly confuse the heck of out things to see a bunch of random old episodes appearing out of order. And links just redirect back to this website where the podcast files don't exist. But what I can do is embed players for each of them in this blog post. You can listen from your computer, but you can't download. Sorry! I'm also going to copy the original show notes from each episode above it, so you'll be reminded what was in it. Welcome to the second episode on scraps! In this episode, we get right down to business and I talk about specialty rulers for scraps, and share a lot of ideas about how to use scraps, including some books. Charlotte Hawkes is our local Queen of Scrap Quilts. A quilter for 10 years, Charlotte's very first quilt was scrappy and she never looked back. In this episode, I interview Charlotte about her system for cutting and saving scraps, choosing quilts, and keeping track of all the projects she's got going on at once. I got a lot of great ideas from her, and I'm sure you will too! I haven't been able to dig up a picture of the blue and white quilt she made that I referenced in the episode yet, but here is one of Charlotte with one of her more recent scrap projects. Also in this episode: Sandy Update, Listener Comments, and many, many thanks! Charlotte's back! Woot woot! You may recall meeting Charlotte Hawkes, the scrap quilter from my guild, from episode 51 In Which We Get Scrappy Again. Some of you asked for more detail, so I invited myself over to her house and set up cameras and all sorts of equipment to go step-by-step through her process. As I mention in the episode, the originally-planned video episode didn't quite work out, so after listening to this audio podcast, please go to my blog for pictures of her system and her quilts. Educational, and eye-candy to boot!